We’ve been studying the life of Abraham lately, and the last time I taught, I encouraged us to rely on the promises of God, for God always fulfills His promises. Our lesson at that time was Abram believing God’s promise that Abram would have more descendants than stars in the sky. Abram believed God and it was credited to him as righteousness. Also, our belief in God’s promises are likewise credited to us as righteousness. The only thing God asks of us is to believe, and God does everything else. But if you remember, Abram had a question to the Lord – he was 85 years old and had no children. How was the Lord going to fulfill this promise? Abram believed anyway. So in today’s lesson, Abram (or Abraham as he is known now), is closer to 100 years old, and the Lord in His plan gives Abraham a son. And I thought we’d talk about the long years while Abraham waited, seemingly on unanswered prayers. This looks like it’s going to be a long lesson today, and I apologize in advance, but the bible says that he who endures to the end will be saved. II. 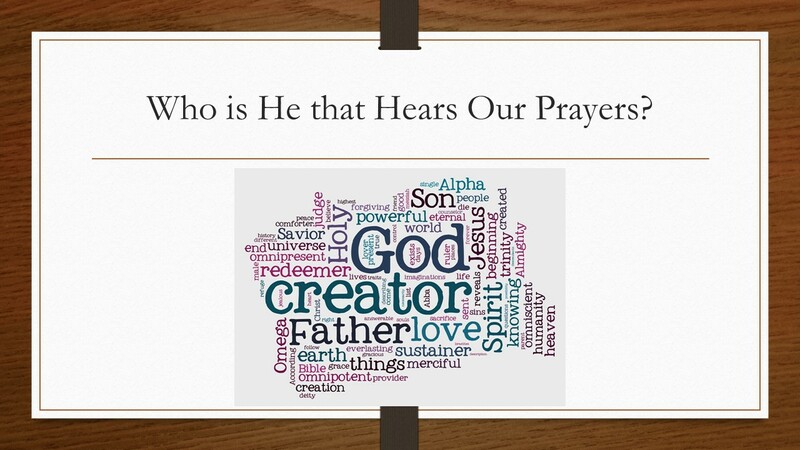 Who is He that Hears Our Prayers? Who is the Lord that He has the power to answer prayer? The more I study the Lord, the less I seem to know about Him. Early knowledge included His power – Genesis 1 describes powerfully how God spoke the universe into existence. I can’t speak anything into existence. I can’t even speak to my dogs and have them listen. Yet an entire universe was created with a Word. Then I learned how much He loved me. How he knitted me in my mother’s womb, how I was to consider myself fearfully and wonderfully made by His loving hands. He loved me so much, that because I was unable to save myself, God sent His only son to die for me while I was still a sinner. And I learned about His holiness. God is pure, and no sin is tolerated in His presence. It is obliterated. Heaven isn’t full of good enough, Heaven is perfect. How can I, as a sinner, approach a holy omnipotent God? The thought terrifies me, that I am unworthy to approach such power and holiness. But through the sacrifice of Jesus, I am covered by His blood, and God accepts me as I am. When Jesus died and the curtain leading to the Holy of Holies in the Temple was torn in two from top to bottom, our separation was over. We can now go boldly to the throne with our petitions. It is incredible that God allows us such access. I know that, on my own, I am not worthy, but I can speak to an incredibly powerful Lord who hates the sin within me solely because I have placed my trust in Jesus. The Lord speaks to us through His Word, but we speak to Him through the awesome privilege of prayer. III. Why Does He Not Answer All Prayers? But even though we have direct access to the power of God, God is not ours to command. It is said that God answers every prayer, even if sometimes the answer is “no.” Habakkuk must have felt the same way when He looked at the horrible behavior of His nation and wondered why God wasn’t doing anything about it. How long, Lord, must I call for help, but you do not listen? Or cry out to you, “Violence!” but you do not save? Have you ever felt that way? That God isn’t listening, or not taking action? You’re praying fervently, and God seems to be silent. Frustrating, isn’t it? Some might feel that if God isn’t answering, then why should I bother to pray? Sometimes, though, it only seems that God hasn’t answered. Perhaps God has answered in an unexpected way. For instance, perhaps the plan of God is so natural that we don’t recognize the answer. Sometimes the plan of God is just living by faith daily – and God meeting our needs so naturally that we don’t realize that in the process of living, God is answering our prayers. We’re still waking up above ground. We’re still breathing air. We’re still drinking water. Even though we don’t deal with manna or scorpions and fiery serpents – at least, I don’t think any of us here do – we do have those various things that God does for us, even problems that God solves for us, every single day. We become so used to God’s working in our lives that we don’t even realize that God is working in our lives. 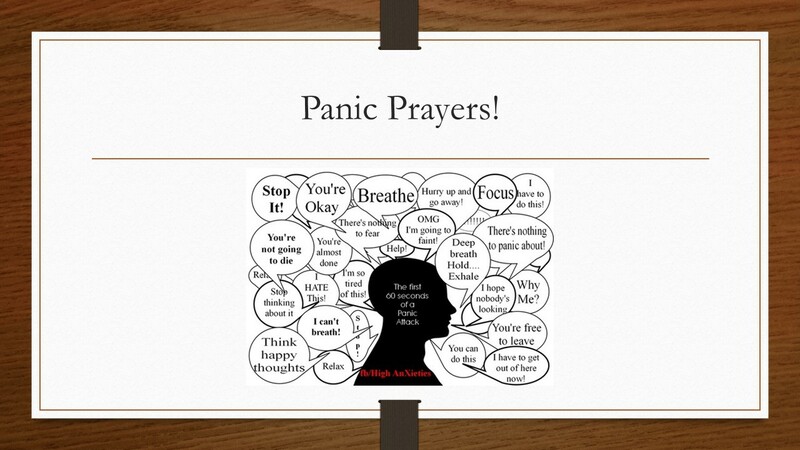 Sometimes we pray panic prayers – we’re about to lose our balance, or our car is about to hit something. We cry out to God, “God, help me.” And God helps us. We say “whew” and take a deep breath and never stop to think that God has answered that prayer. Or perhaps we are recovering from the flu, or we need some money to get us over a financial problem. We do not stop to realize that God is answering our prayers, even those prayers that we may have only prayed mentally. God continues to progress His plan, answering prayers continually that we barely notice. The key phrase here is “all things.” Sometimes God’s plans seem to move slowly because “all things” is complex. It takes time for all things to work together. Sometimes it takes a very long time for all things to work together. For those God foreknew he also predestined to be conformed to the image of his Son, that he might be the firstborn among many brothers and sisters. And those he predestined, he also called; those he called, he also justified; those he justified, he also glorified. When God says all things are working together for good, He is saying that He is working throughout time, throughout history, that those He calls may be conformed to the image of Christ. Perhaps when we are in prayer to our Lord, telling Him of our needs and asking for things, that God answers by encouraging us to be more like Jesus Christ, that we may handle the problems in a Christ-like manner. That takes time. That takes a lifetime. And then perhaps we can understand why God doesn’t give us exactly what we ask for, but instead makes us into the type of person that is better equipped to handle both the problem and the solution. All of these things He brings about to demonstrate His great love and power and glory in His character in us. Another reason God doesn’t answer prayer immediately is to demonstrate that no human effort can answer the prayer. When the prayer is finally answered, there is no doubt that it was God and God alone that answered it. 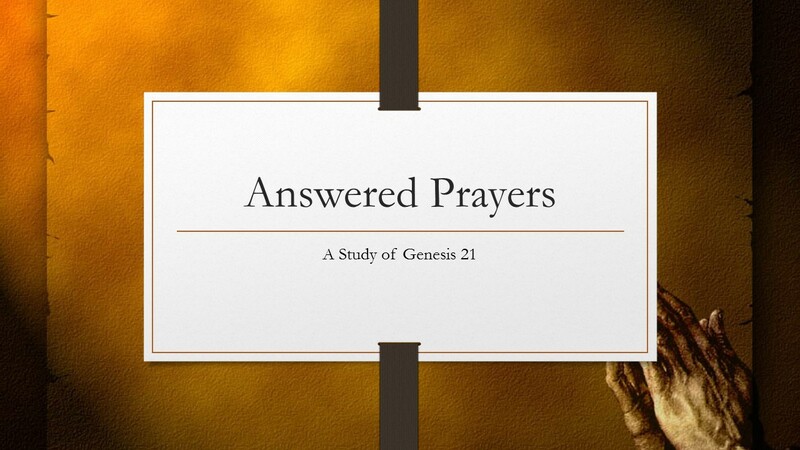 In our study today of Genesis 21, we see evidence of God answering prayers to demonstrate that God alone is sovereign. The last few weeks we’ve been studying God’s promise to Abraham that God would provide a son. We learned that when God reminded Abraham and Sarah at the age of 99 that he had not forgotten His promise, they laughed. God had promised Abraham that through this son, Abraham’s descendants would be more numerous than the stars in the sky and that they would be blessed and lead many nations, and the descendent that would redeem all mankind as the messiah would come through Abraham’s lineage. And Abraham laughed. In Genesis 21, Abraham is 100 years old now, and Abraham and Sarah have no children together. Abraham has been waiting his entire life, wondering if God was going to fulfil this promise. At what point do you think Abraham started to wonder if God had forgotten? After a week had passed? A year? Ten years? Now the Lord was gracious to Sarah as he had said, and the Lord did for Sarah what he had promised. Sarah became pregnant and bore a son to Abraham in his old age, at the very time God had promised him. Abraham gave the name Isaac to the son Sarah bore him. When his son Isaac was eight days old, Abraham circumcised him, as God commanded him. Abraham was a hundred years old when his son Isaac was born to him. Now, God didn’t promise this to Sarah earlier that day, or earlier that week. God had made this promise decades ago. Abraham and Sarah laughed when reminded, because so many years had gone by that surely they believed God wasn’t going to answer this prayer. When we wait for decades for God to answer a prayer, there is only one solution. We must help God and take matters into our own hands. Isn’t that what we try to do? 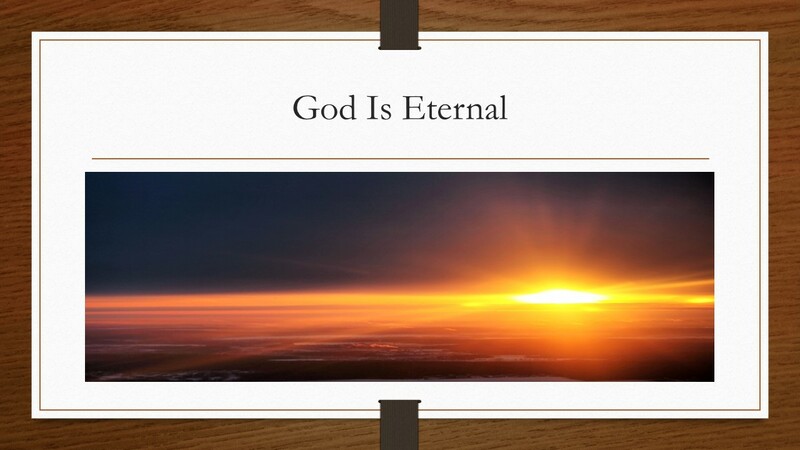 God’s promise is so long in coming, God doesn’t seem to be doing His part, so we decided that God needs our help. Abraham and Sarah did the same. Abraham and Sarah came up with their own plan, that Abraham would have a son with their maid. That wasn’t exactly God’s promise, and perhaps God is reminding Abraham of that in verse 3 when He says “Abraham gave the name Isaac to the son Sarah bore him.” God made the promise to Abraham and Sarah, not to Abraham and the maid. In God’s plan, Sarah was to be the mother. It says in verse 5 that Abraham was 100 years old. Why did God wait so long? To clearly demonstrate that this child was from God. It was a miracle that they had a child at this age. Sometimes when God doesn’t answer a prayer right away is because he has a different plan, a better plan, and He will answer the prayer in a way that it is an unmistakable gift from God. What are you praying for? Are you, like me, praying for something that is taking weeks or months or years for God to answer? The only advice I can offer is – keep praying. Perhaps God’s answer won’t be as dramatic as giving Abraham a son at the age of 100, but when God does finally answer it, you can be sure of two things – It was God alone who answered the prayer, and it was worth the wait. Sometimes the Lord waits to answer prayer because there is something in our hearts that isn’t right with Him. There is some thing, some plan, some scheme that we are working on to solve the problem. We say we’re willing to wait on the Lord, but since He’s so slow, why, we’ll just take care of it ourselves. God wants us to put our trust completely in Him. Blessed are they that wait for Him. And sometimes the plan of God is so amazing that He has a much better answer than the one we were expecting. Many times God doesn’t give us what we ask; sometimes God actually says “no” so that He can give us something better. Whatever this thorn was, Paul pleaded with God to remove it. And after at least 3 petitions to the Lord, God’s response is, “I’m not going to remove your thorn. I’m going to give you something better. I am going to give you my grace, My strength is made perfect in weakness.” In other words, God will demonstrate that it is not man that accomplishes much, but God that accomplishes everything. Perhaps you’re thinking of a prayer you have that God hasn’t answered. Health, job, relationship… while you’re praying and wrestling with the problem, have you discovered that God is perfecting you, strengthening you, teaching you His ways? In that very position of weakness, God makes His strength perfect. Whatever our prayer is, we spend more time praying, pondering God’s power or God’s will, wondering what God might do because of that weakness than if we didn’t have that problem. Sometimes God allows problems to come into our lives or to stay in our lives, because He knows that while we are weak in the face of our problems, He can strengthen us, teach us to depend on Him alone. Sometimes God says “no,” so He can give us something better. This is the confidence we have in approaching God: that if we ask anything according to his will, he hears us. And if we know that he hears us – whatever we ask – we know that we have what we asked of him. Why hasn’t God unleashed the bowls of wrath of Revelation? The time is not yet right. Some of His children have not yet accepted the sacrifice of Jesus, and God wants to give us every single possibility so that no one is with excuse. But this verse tells me that I can confidently pray for people to be saved. I can pray for family, for friends. For enemies. I can pray that God will save that person, for it is God’s will that He doesn’t want anyone to perish for their sins. He’s already paid that price. That word, “spend” is also translated as “waste” or “squander.” If we bring a prayer to the Lord whose sole purpose is “just because I want it!”, the bible says that our selfish prayers are not heard. Now, that doesn’t mean you cannot pray for things you want. If I pray for somebody in the hospital, is that something I want? Yes, but it’s not a selfish prayer I’m squandering on my own pleasures. Certainly, we can pray that God will meet our needs. Certainly, we can pray that God will heal our sick loved ones. We can pray about all kinds of things that have to do with us personally, but the kinds of prayers that God doesn’t bother with are the ones that are simply a matter of fun and games. There are much more important things to pray about. It’s important to pray with the right motives. So we can begin each prayer by asking the Lord to seek our hearts and let us know if there is any sin in us, like David says in Psalm 139. God will answer than earnest prayer. Then we confess that sin to the Lord and ask him to remove it from us and cleanse us from our unrighteousness. And if we are righteous, then James 5:16 says the prayer of a righteous person is powerful and effective. So we confess our sins and accept the Lord’s forgiveness, we spend time in His Word to understand His will in our lives, we offer prayers and petitions in as unselfish way as we can to our Almighty Lord. And then what do we do? We wait, and we trust. From this writing I have the impression the writer seems to mix Jesus with God or seems to take Jesus as his god, though according to the Holy Scriptures Jesus is the son of God and not God himself. By “the writer,” I assume you mean me. I do not confuse Jesus the Son with God the Father. That said, I affirm my belief in the Trinity of God the Father, Son, and Holy Spirit. Jesus is Lord.